Thomas the Tank Engine returns to the B&O Railroad Museum in Baltimore! Take a 25 minute train ride behind Thomas the Tank Engine, meet Sir Topham Hatt, and enjoy a full day of live entertainment, activities, and family fun! Tickets on-sale beginning February 1, 2016. Visit www.ticketweb.com/dowt or call 1-866-468-7630. Advance purchase recommended for the train ride. Please note that everyone including B&O members will need to purchase a ticket for entrance into the museum during this six day event. Coupons, vouchers, discounts, consignment tickets, complimentary passes, membership cards, etc. are not accepted during Day Out With Thomas. Hose wagon rides and demonstrations with hand- and horse-drawn apparatus, working steam engines, antique models, kids’ contests, working draft horses, Dalmatians, and food vendors! Fun for the whole family! Each year the Chesapeake Region of the Antique Automobile Club of America (AACA) puts on an antique car show at the Fire Museum. Featuring both classic and custom vehicles, as well as trucks, motorcycles, police and military vehicles, it’s an event the whole family will enjoy. 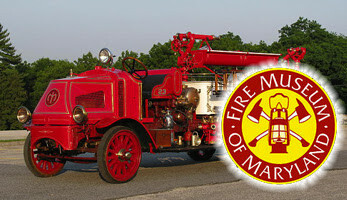 Our annual salute to fire, police, EMS, and military personnel, with antique fire engine demonstrations and car show. Sponsored by area businesses and the citizens of Baltimore County, Honoring our Heroes is a great way to say “Thank You” to all of our community members in uniform. A family-friendly Halloween. See fire apparatus in a new light: etched glass signal lamps and kerosene lanterns; also visit with re-enacters in period attire. Wear your Halloween costume and get in for 1/2 price! Watch as O-scale trains wind through a 20th century town. On Opening Day, get a free photo taken with Santa in a Fire Chief’s sleigh, from 11am until 2pm! Visit the museum website for more information and events. questions about its most important ritual objects. Synagogue. Activities will be suitable for the whole family. groundbreaking photographer, artist and pioneer in American history. convention and a disregard for stuffy authority. annals of Jewish movie medicine. grave disparities we see in the health of populations.